Mediterranean Chickpea Stew is a delightfully flavorful slow cooker recipe that will satisfy your craving for a hearty soup or stew. Mediterranean Chickpea Stew. A tasty, healthy, vegan and gluten free meal-in-one. Hi. 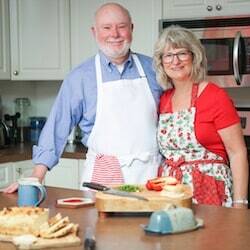 It’s Lois in the kitchen at Recipe Idea Shop, telling you about this superior slow cooker recipe, Mediterranean Chickpea Stew. Goodness gracious! I was looking for this recipe and found that somehow it got lost and isn’t on Recipe Idea Shop anymore! So I’m putting it up again. It is excellent—a bit tangy, full of flavor and packed with deliciousness. 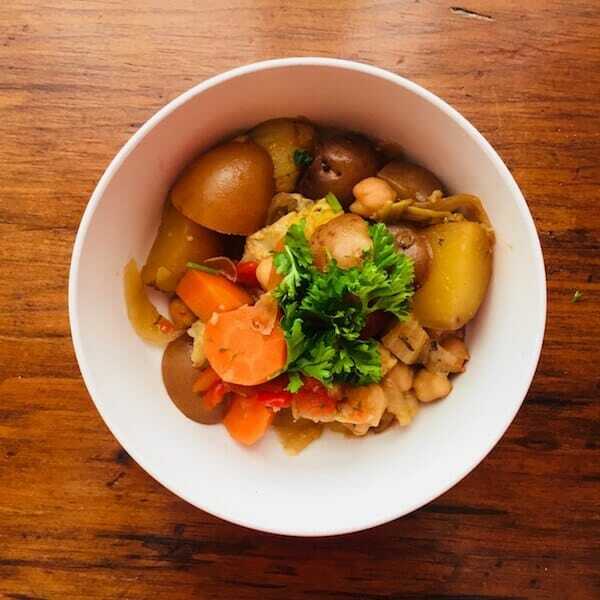 The potatoes, carrots and other vegetables make it very hearty. I like my stews with more liquid than some people do, so I don’t drain the tomatoes. I add the juice to the stew. I also use my Homemade Vegetable Stock instead of store-bought stock, and if I don’t have any, I add vegetarian bouillion and water in place of it. This Mediterranean Chickpea Stew comes from Robin Robertson’s Fresh from the Vegetarian Slow Cooker. Robertson’s recipes are always superior. She has several cookbooks on the market and I own three of them. 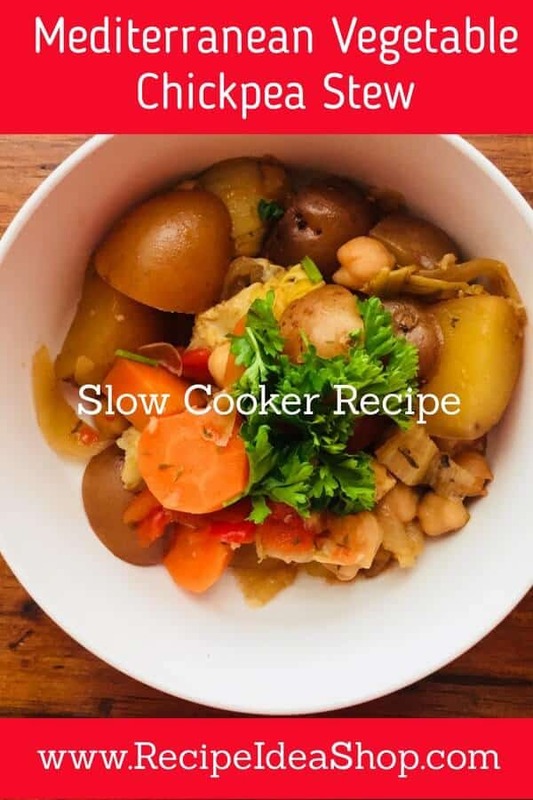 Fresh from the Vegetarian Slow Cooker is my favorite (I absolutely love it! ), but I like Vegan Planet and Fresh from the Vegan Slow Cooker a lot, too. Get yourself at least one of these cookbooks! Check out the recipe. 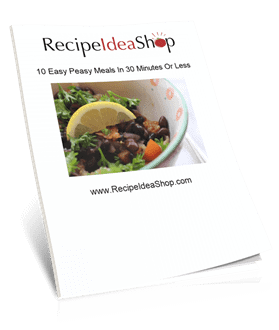 Buy this cookbook today on Amazon. Instant Pot LUX60V3 V3 6 Qt 6-in-1 Multi-Use Programmable Pressure Cooker, Slow Cooker, Rice Cooker, Sauté, Steamer, and Warmer. Buy it today on Amazon. Add the shallots, carrots and fennel and cook until soft, about 5-6 minutes. Toss in the garlic and cook for 30 seconds more, stirring to prevent burning. Transfer the cooked vegetables to a 6-quart slow cooker (Crockpot). Add the remaining ingredients, except the fresh herbs. If you are using dried herbs, add them now. A few minutes before serving, add the fresh herbs (if using). 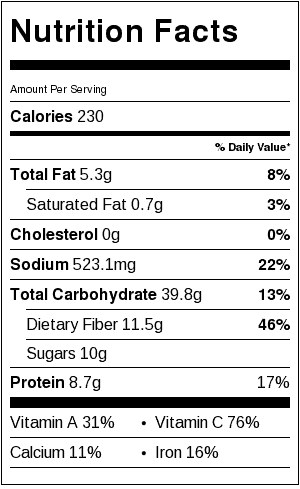 Mediterranean Chickpea Stew Nutrition Label. Each serving is about 1&1/2 cups.